-1. A Qi Wireless Charger Pad is required (not included) to charge your phone wirelessly. -2. Please ensure you purchase a genuine Qi wireless charging pad with your Receiver, because some low quality Qi charger may cause overheat during charging. -3. Make sure the receiver and the charger are placed on the right position. -4. Please don't use any metallic or thick cases as the wireless signal can't get through them. -5. When unplugging it, please take the connector instead of the line to pull it out, so that it can last for a much longer time. -6. 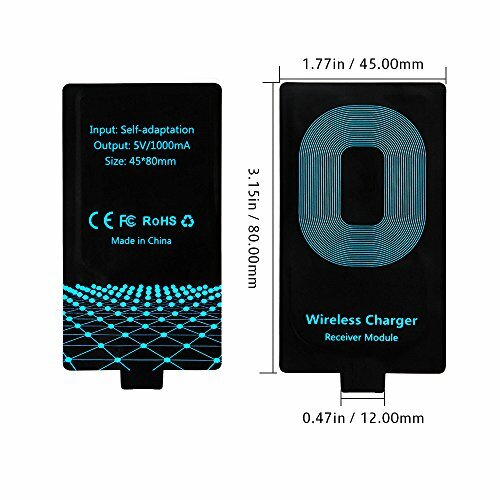 5V/1000 mA high current output provides rapid wireless charge which is the fastest you can get. *This product is covered by a factory warranty, which is only available from authorized sellers. Future Charger is the only authorized seller of this product. 2. EASY INSTALLATION : Just insert it into lightning charging port and place down your phone or any QI-enabled devices on QI charger. 4. ULTRA SLIM: 0.04inch ultra slim design, compact and lightweight without increasing additional weight to your phone. 5. LOW HEAT EMISSION: Adopt intelligent control charging IC and WPC Ferrite of TI, to prevent your phone from overheating during charging, make your phone get charging safer and more stable. If you have any questions about this product by FutureCharger, contact us by completing and submitting the form below. If you are looking for a specif part number, please include it with your message.